The Washington Nationals routed the New York Mets, 25-4, on Tuesday, the Mets' most-lopsided loss in franchise history. Gus Rosendale reports. The Nationals set the team scoring mark dating to their days as the Montreal Expos in 1969. It was the Mets' most-lopsided loss in their 57-season history, worse than a 26-7 pounding by Philadelphia in 1985. Reyes made the first pitching appearance of his career, and the 35-year-old infielder got tagged for home runs by Matt Adams and Mark Reynolds in a six-run eighth. Throwing a fastball in the mid-80s mph and a curve in the upper 40s, Reyes gave up five hits and walked two. Reyes also plunked Ryan Zimmerman with a soft toss. 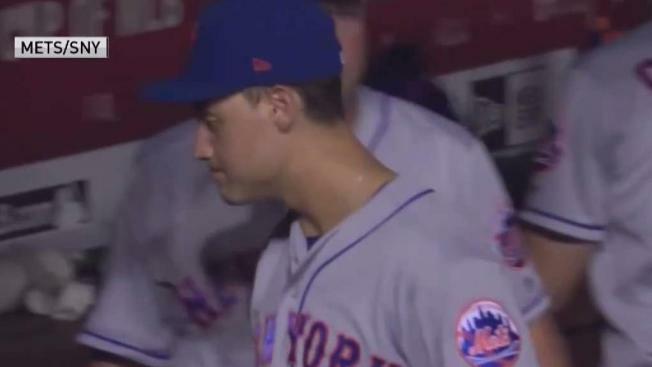 After getting hit in the leg, Zimmerman playfully faked a charge toward the mound, drawing a laugh from Reyes, who wore one of ace Jacob deGrom's gloves on the mound. The game got so out of hand, Mets television announcers Keith Hernandez, Ron Darling and Gary Cohen took turns reading verbatim from the team's media guide in the late innings - the SNY network played the theme from "Masterpiece Theatre" in the background. After the game, the team responded to the loss on Twitter with one tell-all emoji. Jeff McNeil hit his first career home run. As he headed from the plate back the Mets dugout, he already had the souvenir. The ball came back on the field, and was flipped to him before he reached the bench.